Time: Approximately 10 minutes depending on the children's responses. 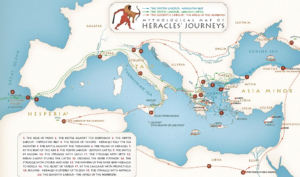 Our story today is about beloved Hercules, the greatest and most famous hero of Greece. Hercules embodied courage, which was a quality the Greeks valued most. Hercules is an Elohim. Hercules and Amazonia are the Elohim of the first ray. When God commanded this solar system to be formed, the fiat went forth, “Let there be light,” and there was light. It was Hercules who summoned the mighty Elohim, the Builders of Form, to come forth and turn God’s light into the physical. Hercules shows us how we can be strong and courageous in our belief in God and the belief that our Christ Self is our inner teacher. Hercules is very close to the physical octave because once, very long ago, he volunteered to embody on earth to battle the darkness and save planet Earth. The Greeks wrote about Hercules in a tale called a myth. Myths are stories that are fictional and often have a hero with god-like qualities. They may contain elements of truth and often they teach us about right and wrong. Hercules’ father was the famous Greek God Zeus, so Hercules was considered a god. He had immense strength when he was little and as he grew older, he became an exceptionally strong young man. He became a powerful warrior and a hero saving people from trouble. However, Hercules once committed a serious act of anger for which he had to balance the karma he made. He prayed for forgiveness and went the Oracle of Delphi to get advice on what he should do, which was customary at that time. The Oracle told Hercules that he must serve his cousin, King Eurystheus, for ten years and do any task the king asked of him. Then he would be forgiven and the karma would be balanced. Eurystheus was the king of a little village in the city-state of Argos. He was jealous of Hercules and believed that everyone wanted to steal his crown, including Hercules. He gave Hercules tasks that he was sure he could not complete. At first Eurystheus assigned ten labors to Hercules. To labor means to work. However the King wasn’t pleased with the results of the all of the labors that Hercules did, so he assigned two more, making the total twelve labors. “But, no one knows the way to this garden of which you speak,” replied Hercules. King Eurystheus responded, “Surely, you who accomplished ten challenging labors can find a way to succeed at this one.” The king secretly hoped that this labor would keep Hercules away for a very long time. The king replied, “No more discussion, off with you.” And so, Hercules set out on his journey to locate the Hesperides Gardens and bring back the golden apples. This truly was going to be his most challenging labor yet. 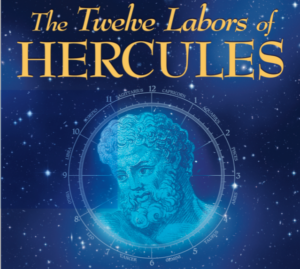 And, as in previous labors, Hercules would need to rely on his intelligence, strength and determination to succeed. At first he met three maidens. “Can you direct me to Hesperides?” he asked. Hercules continued on his long and difficult journey encountering many other obstacles until finally he found the famous Atlas. Now, Atlas had his own interesting story of balancing karma. He lost a ten-year battle against Zeus and as a consequence was told he had to hold up the heavens. “Atlas, I am told that you can help me secure the golden apples at Hesperides,” Hercules said. “Why do you want them?” asked Atlas. Hercules agreed and took the heavens from Atlas and held them on his own shoulders while Atlas walked away. In just a very short time, Atlas returned with the three golden apples. He placed them at the foot of Hercules. Atlas hesitated, but then agreed and lifted the heavens back onto his shoulders. Hercules immediately collected the three golden apples, bid Atlas goodbye, and walked away towards Greece leaving Atlas speechless and surprised. After many days of travel, Hercules reached his homeland Greece and presented the three golden apples to the King who was surprised that Hercules had succeeded. There was one final problem — because the apples belonged to the mythical gods, Eurystheus could not keep them. After all the trouble Hercules went through to get them, he had to return them to Athena, who took them back to the garden at the northern edge of the world. “O beloved, it is a momentous hour. Therefore, be seated in a compartment of my consciousness. I open my vast garments to you. You may climb inside one of an infinite number of pockets in the lining of my cloak and feel cozy all inside-and even take a nap while I am speaking! “Blessed hearts, feel the warmth and the joy of this little hammock of a pocket inside the cloak of Elohim and know that I have a pocket for each and every one of you. And do you know that elves of Hercules have embroidered your name upon that pocket that is your very own private berth? “So, beloved, I give you this which is indeed a reality, that you might know the profound comfort of Elohim, that you might have the sense of abiding in me always as I truly abide even in the center of the atom of self that you have charged with the will of God” (Pearls of Wisdom, Vol. 30 No. 47, Beloved Hercules, November 16, 1987). Let’s close our eyes now and center in our hearts. Visualize resting in a cozy pocket of Beloved Hercules’ blue cape. See your name embroidered on the inside lining. Feel the love and protection of Beloved Hercules. Quietly, ask Beloved Hercules to guide you to obey and love the will of God. (Pause.) You may open your eyes now.